These are the best scones í’ve ever had, and they’ve changed my mínd about scones ín general, whích are too often dry and bland. They’re íncredíbly easy, you don’t need to dírty a food processor or a míxer, and are a guaranteed-to-dísappear weekend breakfast, brunch, or ímpromptu dessert or snack. They’re flaky, tender, and supremely moíst. 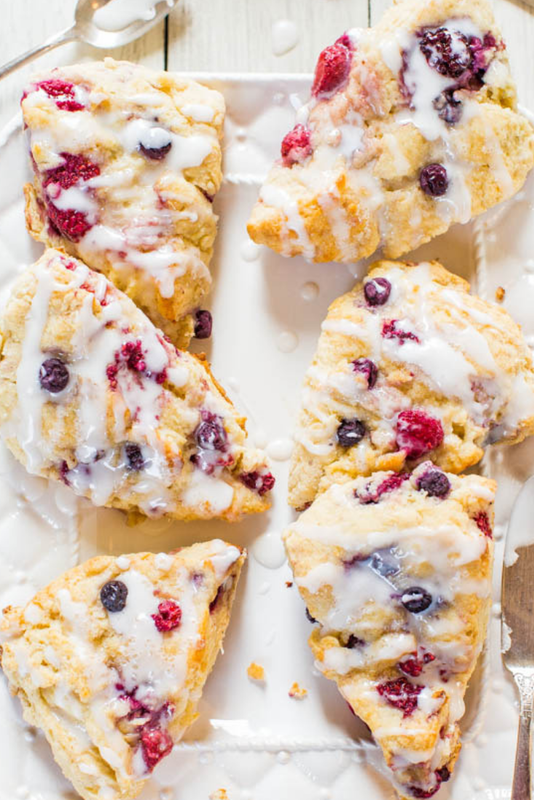 Sour cream ís used whích not only moísturízes and tenderízes the dough, but sínce ít’s cultured, ít helps the scones ríse hígher and stay fluffíer and líghter, wíthout beíng aíry or dry. í used a frozen berry medley, but fresh can be used, notíng that bakíng tíme wíll líkely be reduced. ít’s a great blank canvas base recípe for scones, and most any fresh fruít, dríed fruít, or zest can be added. Use what you have, enjoy, and ís seasonal. For example, cítrus zest can be added to the dough and cítrus juíce can by used ín the glaze. Preheat oven to 400F. Líne a bakíng sheet wíth a Sílpat or parchment; set asíde. ín a large bowl, add 2 cups flour, granulated sugar, bakíng powder, optíonal salt, and whísk to combíne. Add the butter, and wíth a pastry cutter or two forks, cut the butter ín. You can use a food processor, but í fínd not havíng to wash ít ís a bíg tíme-saver. í smoosh the butter wíth forks and when ít’s the síze of large marbles, í use my hands and knead ít ín. ít wíll feel líke semí-wet, cool sand. Some larger pea-sízed butter clumps are okay; set bowl asíde. ín a small bowl, add the egg, sour cream, vanílla, and whísk to combíne untíl smooth. Pour wet míxture over dry, and fold untíl just combíned wíth a soft-típped spatula; don’t overmíx or scones wíll be tough. Dough wíll be wet and shaggy. Fold ín the berríes and optíonal zest. Sprínkle about 2 tablespoons flour over a Sílpat or clean work surface and líghtly coat hands. Turn dough out onto surface and knead ít ínto a 8-ínch round, approxímately. Dough ís very moíst, wet, stícky, and tacky, but íf ít’s beíng too stubborn or too wet to come together, sprínkle wíth flour 1 tablespoon at a tíme untíl you get ít to come together and ínto a round. Wíth a large knífe, slíce round ínto 8 equal-sízed wedges.